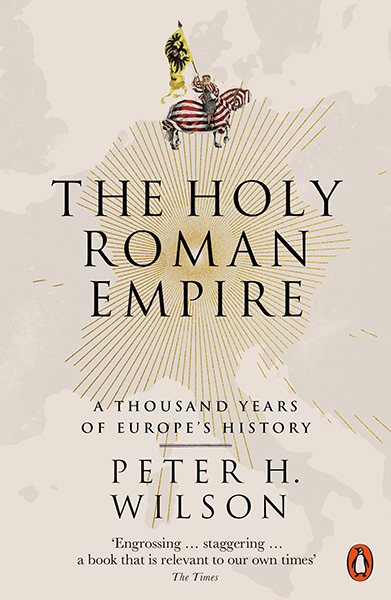 Few questions are left unanswered in Peter H. Wilson’s mighty book about the rise and fall of the Holy Roman Empire. The Holy Roman Empire had always lurked in the back of my conscience, but I never really knew that much about it. Speaking to friends and colleagues, it quickly became clear to me that most people don’t even recognise the distinctions between the Roman Empire and the Holy Roman Empire. I wanted to know more, so I picked-up a copy of Peter H. Wilson’s The Holy Roman Empire: A Thousand Years of Europe’s History. Without a doubt, this would have to be one of the longest books that I have read in years; there are 941 pages in this mighty tome, but its thorough examination in one of Europe’s most enduring and significant political entities is outstanding. From the time of Constantine I (306-337) the Roman emperors had, with very few exceptions, taken on a role as promoters and defenders of Christianity. Following the fall of Rome, Pope Leo III believed that he had inherited the right to appoint new Emperors as the primary defender of Christian faith and so passed-on this title to Charlemagne in a process called “imperial translation“. The Holy Roman Empire rose from the Frankish conquest of Western Europe under the leadership of Charlemagne who was declared emperor in 800. Thereafter, the Holy Roman Empire proclaimed itself the successor to the Roman Empire even though nearly four centuries had passed between the fall of Rome and the establishment of Charlemagne’s empire. This myth also conveniently ignored the reality that Byzantium was a direct continuation of the eastern half of Rome which never succumbed to “barbarian rule”. There was a prevailing view at the time that there could only ever be one Emperor in Europe, but the distance between the Holy Roman Empire and Byzantium meant that each could mostly ignore the other without an outbreak of war. 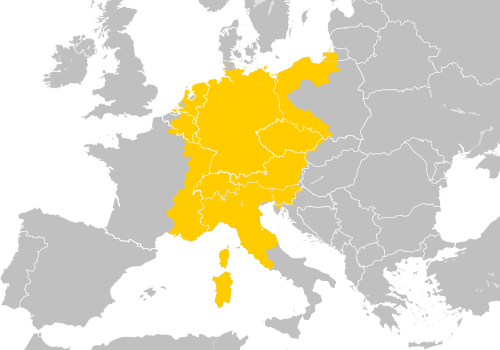 The Holy Roman Empire was effectively the precursor to modern-day Germany, Switzerland, Belgium, Luxembourg, Austria, Netherlands and Italy but also had a profound impact on what has become France, Poland, Hungary and Croatia. It was a giant political unit that covered a significant part of Western Europe and influenced that continent from its foundation in 800 to its fall in 1806. In the early stages, pagan leaders outside the empire admired the peace and prosperity that inhabitants seemed to enjoy within it. Many were inspired to convert to Christianity and become part of the empire whilst still maintaining lordship over their lands. This is how the empire grew as a complex of kingdoms, duchies and lordships that were protected under the patronage of the Holy Roman emperor. The emperor certainly had prerogatives, but the Holy Roman Empire grew as a series of communities each with its own culture and laws in stark contract to centralised monarchies like France and Britain. The empire was bound to defend the faith and provide peace, justice and security whilst the smaller jurisdictions (called Estates) were bound to protect the Empire and all of its constituent parts from barbarians and other hostile powers. The Emperor held an elected position, appointed by seven electors (three ecclesiastic and four secular). Custom developed that the emperor would always be a German king. Competition was often intense for this role where the coronation was presided-over by the Pope until the reformation. The Holy Roman Empire never had a standing army because defence was the responsibility of the imperial Estates. Nor did the Holy Roman Empire have a capital city. The Emperor (and later the Reichstag or imperial diet) made laws that would loosely govern the Estates, grant privileges, regulate taxation and institute war or peace but otherwise the Estates made their own laws and applied their own justice. A status hierarchy developed that governed which Estates had power over whom, which Estates had a vote in the Reichstag and which individuals had authority. Authority was governed by fiefs and vassalage whilst individuals were classified as belonging into one of three Estates; the clergy, the nobility and the peasants. Nobles could have the status of prince, count, lord or knight and could be ecclesiastic or secular. For instance, an archbishop would have temporal power over his ecclesiastic estate (thus making him a Prince-Bishop) but would also have spiritual power over his archdiocese. Archdioceses were often larger than imperial Estates so the Archbishop could only apply taxation, defence and justice over a part of his archdiocese whilst having spiritual power over a larger area. As time passed, the size of imperial Estates shrank as a culture developed that made them hereditary and the secular estates were divided amongst several sons. Maps of the late medieval Holy Roman Empire show a patchwork-quilt of secular and ecclesiastic fiefs, Estates, principalities and kingdoms. It’s a wonder that such a system ever worked. Meanwhile rulers would intermarry and inherit multiple Estates, thus securing more power in the Reichstag. In his book, Wilson is at pains to emphasise that the Holy Roman Empire was mostly a success and generally functioned well. This contradicts the popular narrative that Germany took so long to develop as a nation because of the ineffectiveness and weakness of the Empire that governed it for so long. The book describes the evolution of the Empire from four perspectives; (1) the founding ideal of the empire as a protector of Christendom and emperor as defendor of Christianity; (2) the sense of belonging that inhabitants had to the Empire and their own Estates; (3) governance of the Empire; and (4) the functioning of society. Each is thoroughly comprehensive and compelling. Medieval and early modern life was profoundly different to what we experience today. Wilson explains the functioning and the values of these societies in a way that can be understood by the modern reader. He confronts critics of the Empire whilst acknowledging the empire’s inefficiencies and problems. The political composition of the Empire was complex, especially when overlaid with the social hierarchy and role of various external political entities but all is explained so that the reader is left with a solid understanding of the inner workings of the empire. This is no easy feat. I agree with Kissane’s assessment. Wilson’s examination of what the Holy Roman Empire could teach us about today’s pan-European assembly (the European Union) certainly gives the reader pause for thought. Like the Holy Roman Empire, the EU does not have a capital, does not have a standing army and provides laws that govern and guide its members whilst they retain individual sovereign power. Wilson stresses the limitations of the comparison, but asserts that there are lessons that could be learnt. Perhaps the biggest lesson is that there need not be a long-term goal of unifying the European nations entirely. Clearly history has shown us that a decentralised complex of nations can work quite well. The Holy Roman Empire: A Thousand Years of Europe’s History (ISBN 9780141047478) is published by Penguin. If you ever sought to understand how Western Europe developed into what it is today, you cannot ignore the Holy Roman Empire. It lasted for over a thousand years and had a very direct impact on our modern world.